​As the visitor enters the archaeological area on the southern slope of the Acropolis from Dionysiou Areopagitou Street, and heads upwards, on the slope to his right will encounter the most ancient theater of the world, the Theater of Dionysos. ​The most important ancient Greek poets, Aeschylus, Aristophanes, Euripides, and Sophocles saw premiere performances of their plays in the 5th century BC, in this very theater. The auditorium and the proscenium were made of wood. In the 4th century BC they were reconstructed using marble. Sections of the stone auditorium survive. According to experts, the theater had a capacity of 17,000. 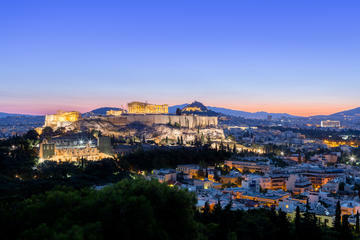 ​On the slope overlooking the theater, carved on the rock of the Acropolis, is the choragic Monument of Thrasyllos (319 BC) and two choragic Corinthian columns. ​The Theater of Dionysos Eleuthereus is a major open-air theater and one of the earliest preserved in Athens. 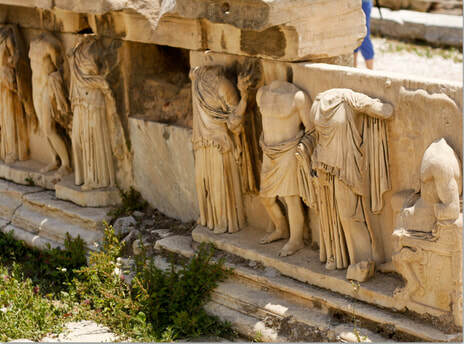 It was used for festivals in honor of the god Dionysos. 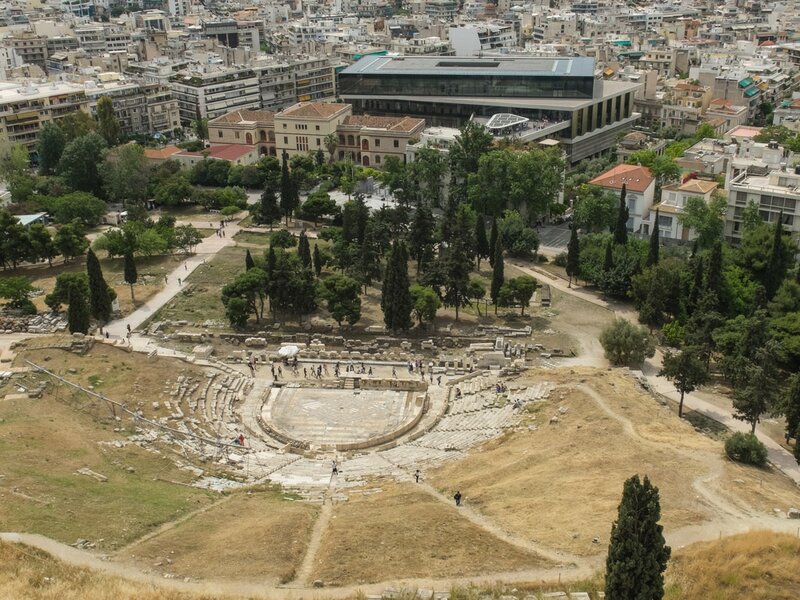 The site of the theater, on the south slope of the Athenian Acropolis, has been known since the 18th c. The Greek Archaeological Society excavated the remains of the theater beginning in 1838 and throughout most of the following century. Early remains in the area relating to the cult of Dionysos Eleuthereus have been dated to the 6th c. BC, during the rule of Peisistratos and his successors, but a theater was apparently not built on the site until the 5th c. BC. The only certain evidence of this early theater consists of a few stone blocks that were reused in the 4th c. BC. 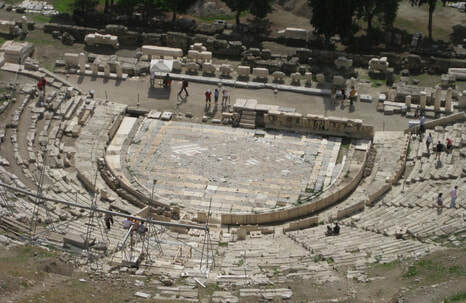 During the 6th c. BC, performances associated with the festivals of Dionysos were probably held in the Athenian Agora, with spectators seated on wooden bleachers set up around a flat circular area, the orchestra, until the seats collapsed in the early 5th c. BC, an event attested in ancient sources. After the collapse of the stands, the dramatic and musical contests were moved to the precinct of Dionysos on the slope of the Acropolis. The early theater there must have been very simple, comprising a flat orchestra, with a few rows of wooden or stone benches set into the hill. The oldest orchestra in the theater precinct is thought to have been circular (or nearly so) with a diameter of around 27 meters, although there is some debate as to its original size and shape. A wooden scene building (skene) was apparently introduced at the back of the orchestra, serving for the display of artificial scenery and perhaps also to enhance the acoustics. It was in this unpretentious setting that the plays of the great Attic tragedians of the 5th c. BC were performed. The Theater of Dionysos, photographed by Ernst Reisinger, 1923. By the end of the 5th c. BC, some of the wooden constructions had been replaced with stone. The Theater of Dionysos in its present general state dates largely to the period of the Athenian statesman Lycurgos (ca. 390-325/4 BC), who, as overseer of the city's finances and building program, refurbished the theater in stone in monumental form. The 4th c. theater had a permanent stage extending in front of the orchestra and a three-tier seating area (theatron) that stretched up the slope. The scene building had projecting wings at both ends (paraskenia), to accommodate stairways or movable scenery. Alterations to the stage were made in the subsequent Hellenistic period, and 67 marble thrones were added around the periphery of the orchestra, inscribed with the names of the dignitaries that occupied them. The marble thrones that can be seen today in the theater take the form of klismos chairs, and are thought to be Roman copies of earlier versions. 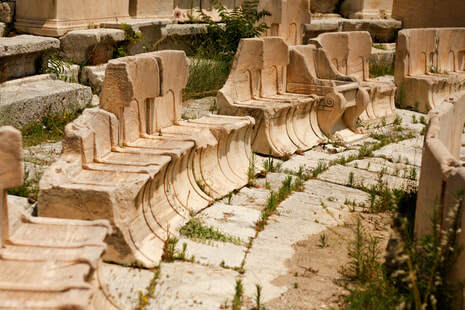 At the center of this row of seats was a grand marble throne reserved for the priest of Dionysos. The Theater of Dionysos underwent a modernization in the Roman period, although the Greek theater retained much of its integrity and general form. An entirely new stage was built in the 1st c. CE, dedicated to Dionysos and the Roman emperor Nero. By this time, the floor of the orchestra had been paved with marble slabs, and new seats of honor were constructed around the edge of the orchestra. Late alterations carried out in the 3rd c. CE by the archon Phaedros included the re-use of earlier Hadrianic reliefs, which were built into the front of the stage building. The remains of a restored and redesigned Roman version of the theater can still be seen at the site today. 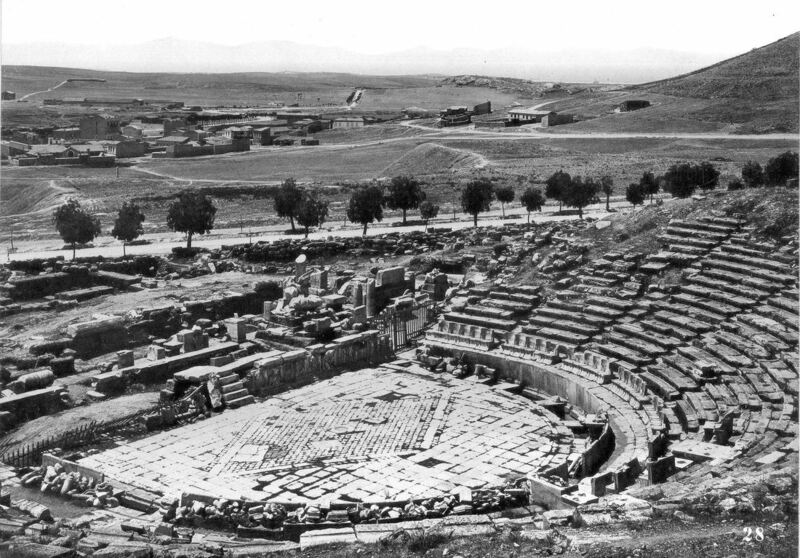 A very old photograph of the Theater of Dionysos, before almost any new structure was built around it. ​The theater was dedicated to Dionysos, the god of wine and the patron of drama; it hosted the City Dionysia festival. Among those who competed were the dramatists of the classical era whose works have survived: Aeschylos, Sophocles, Euripides, Aristophanes, and Menander. The advent of tragedy, in particular, is credited to the Athenians with festivals staged during specific times of year. These dramatic festivals were competitive among playwrights and involved the production of four plays, three tragedies and one satyr play featuring lighter themes. Early on, the subject matter of the four plays was often linked, with the three tragedies forming a trilogy, such as the Oresteia of Aeschylos. This famous trilogy (Agamemnon, Choephori, and Eumenides) won the competition of 458 BC held in the Theater of Dionysos Eleuthereus. The plays tell the story of the curse on the House of Atreus: Agamemnon’s murder by his wife, the revenge of their son, Orestes, upon his mother, and Orestes’ trial in Athens. 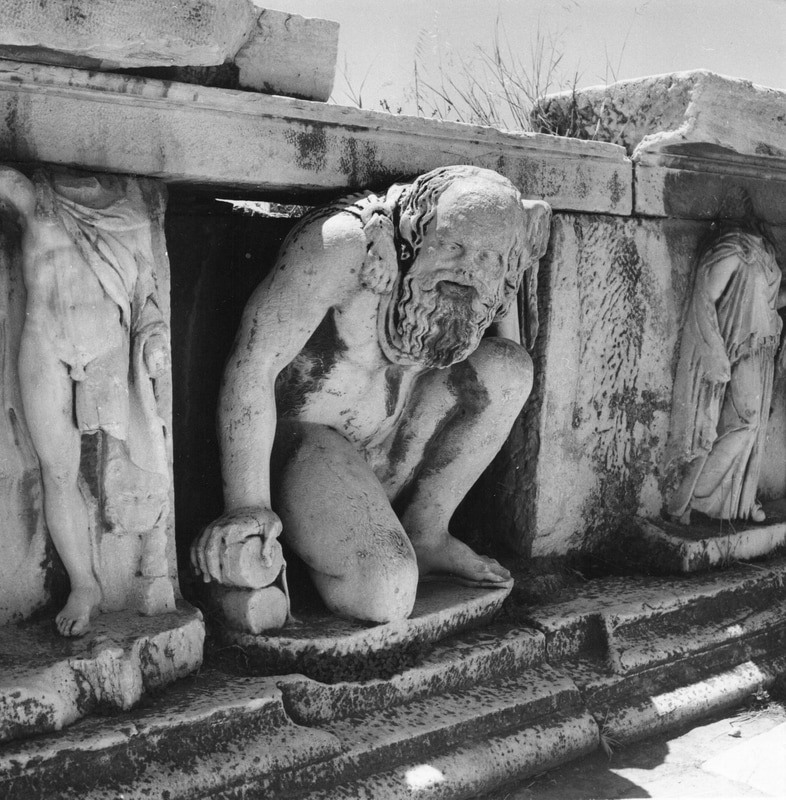 Old photograph of the relief sculptures at the hyposcenium (the low wall supporting the front of the stage in a Greek theater) of the Theater of Dionysos. By the time of the Oresteia, dramatists would have had a skene and probably also a wheeled platform for special effects (ekkyklema) and a lifting device (mechane) available for their productions, as well as the use of a third actor. In the late fourth century exaggerated masks were worn and considered highly important for character identification to an audience consisting of thousands. It is assumed that earlier masks, such as those worn in plays by Aeschylus, were more modest in expression and size. With all this in mind, one can perhaps form an impression of the ancient Theater of Dionysos and appreciate the context of the dramatic performances that took place there. Dionysos, among other sculpture at the hyposcenium (the low wall supporting the front of the stage in a Greek theater) of the Theater of Dionysos. Photo by N. Tombazi. We will recommend two hotels for you to choose from in the wider Acropolis area: Herodion, an excellent medium-size hotel just a few hundred yards away from the Acropolis and Herodeon, offers elegantly decorated modern, AC rooms, fitted with a satellite TV, safety box and soundproofed windows. Most of the rooms have private balconies and some have a view of the Acropolis. It has a beautiful roof garden with sun loungers and 2 hot tubs as well as PointA restaurant, fitted with a decked terrace, serving Mediterranean cuisine, and a variety of cocktails. In between, guests can enjoy snacks and homemade desserts in the semi-outdoor area in the hotel's back garden. An indoor restaurant is also available where American breakfast is served. Finally, Philippos, a reliable small-size value hotel, offers sunny and modern rooms, styled with elegant fabrics and earthy colors, featuring AC, free WiFi, a TV and fridge. Some rooms have Acropolis views from their windows or balconies. Buffet breakfast is served at the all-day café while lunch and dinner are served at the sister hotel Herodion Hotel, located only 40 m away. ​The Theater of Dionysos on occasion hosted meetings of the Athenian Ekklesia after the Pnyx was deemed unsuitable. In the Roman period, "crude Roman amusements" that were ordinarily restricted to the amphitheater replaced the sacred performances once held in the theater, and by the Byzantine period, the entire complex had been destroyed. Seats for dignitaries at the Dionysos Theater of Athens.